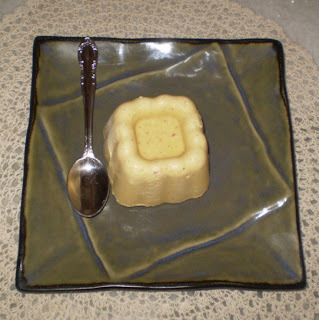 Cooking 4 all Seasons: Microwave Easy Cooking with Sweets - Round up and next Theme! Microwave Easy Cooking with Sweets - Round up and next Theme! When I first thought of wanting to start an event, I chose Lunch box series. But many expressed a wish to have an event on Microwave cooking. Well coming to think about it, I will be most benefited from it. I have been having one for more than 8 years now but have never used it beyond reheating. So my enthusiasm behind this event, is in trying to learn regular cooking using this gadget. Thanks for all your enthusiastic response. I am really overwhelmed, as I was really hesitant if this will actually be received. When I saw Kajals' first entry, I was really trilled. My hubby dear couldn't understand the excitement. It was like appearing for an exam and seeing that the question paper had the questions you knew! Well anyway when I decided to try out one of my favorite sweet dish, it turned out so easy. My kids simply loved it! Just we have to be little more aware of facts and features on using the Microwave properly. So next month's Theme is going to be MEC: Basics. This includes any basic step that can be done using Microwave. Knowing how to do simple thing can always be so useful in actually preparing other complicated dish. So this month's entries can be anything related to Seasoning, Roasting, Toasting, anything that's basic! Check out Jungalbandi for simple things that they used MW for more ideas!. Rules are same, check out this page. Deadline is last day of the month. Only please make note of the time that's taken for preparing the item. 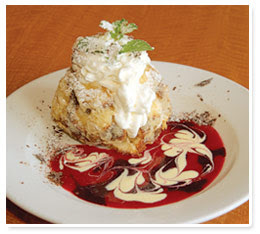 Now coming to MEC: Sweets, I chose Sweets to have a sweet beginning. In Andhra, we begin our meal with a sweet dish. so here comes a prelude to a hearty meal prepared in Microwave. Well before having fun in cooking in Microwave, lets know and take the safety measures. So here comes a list of do's and don'ts. Check out Jyothsna's and Jugalbandi's useful information on safety methods and what to cook and what not to cook. How to and How not to. Well I leave you to read them yourself to get better equipped to cook in Microwave. Am sure their posts will get you hooked to them as I was. Checkout for Jyothsna helpful tips. And if you want some more, you can always land in Jugalbandi and never dream to get away. As usual Bee & Jai entertains us with their witty and interesting post which is so informative. Am sure now we can venture into cooking arts. Presenting the sweets as they paved their way into the Microwave. Kajal from Kajal Dreams, waves a beautiful dream with her Apple Jam. You can spread it on biscuit or a toast, she says. Am sure it must be heavenly. The meticulous way Kajal always presents her recipes are so wonderful to go through and enjoy. 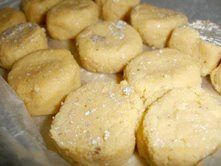 Check out her recipe which is so simple, yet so delicious to eat. Viji from Vcusine enthralls us with the Dish of South India - none other than the Palgova. She rightly says Palkova is the king and queen of sweets. She is not wrong. Believe me, we grew up fancying this sweet. It is not something that we can eat more, but it never stops with one bite, you just go on. Viji explains in simple and easy steps to recreate this tedious dish if otherwise prepared on a stove. 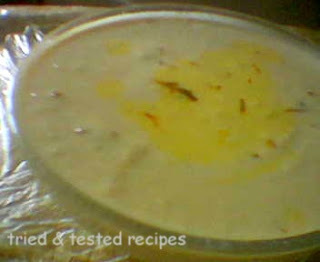 Viji's blog is a mine of recipes for freshers in cooking. She is not only famous for her Weekend brunch which in itself could've been an Event, but for her wisely quotes that she puts in her inbox with her recipes. She ensures she takes care of both mind and body. Presenting to you Ladies and a gentleman (Jai of Jugalbandi) the king and queen of sweets - The Palgova in all its beauty. Next comes a lovely dish from a lovely lady of a fun filled blog called Fun and Food. She says "If you love bananas, you will surely enjoy this easy-to-make delicious dish that caters to your sweet tooth! So go bananas over the Banana Bread Dessert!" Why not, we take your word, Mansi. Well now comes Asha with her wonderful gourd dishes. Who wouldn't know Asha, she magically wades her way to every blog and makes her presence felt. Am sure everybody in this food blog world knows her and she knows them! "Microwaving the Halwa!:)). Cooking has become so much simpler with the invention of the microwave,specially in summer when you don't have to slog before the hot stove most of the time!" 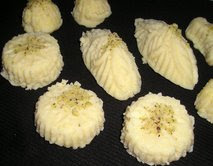 For this event, Asha made Dumrote,a typical Karnataka dessert. 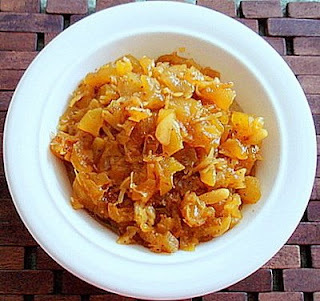 She tamed her out of control bottle gourd into delicious Halwa and all in 23 mins flat! And what a colour it has. All in all, she is a veteran who cooks mostly in Microwave, so any doubts on Microwave cooking, you know where to go. Next dish from Asha is also based on Lauki. Since Asha was not able to send this to this event, I took it myself. Am sure and hope Asha wouldn't mind. Afterall, more the dishes, more the merry! 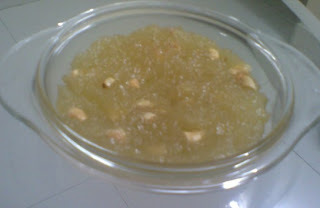 Check out Asha's Lauki Coconut Halwa! Next entry is none other than the sakkarai pongal!. 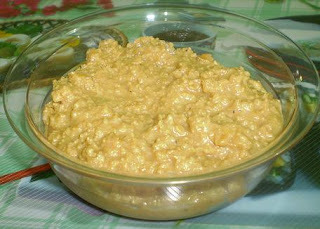 Traditionally Sakkrai Pongal is prepared for the Sankarnti festival in India. In most places for this festival, they specially cook in earthen pots which symbolizes this festive mood. Now we have Sakara Pongal cooking in Microwave! Check the cooking way Easy Crafts cooks this. I am sure it can't get any simpler than this. Sakkara Pongal in 22 minutes! Next came Archana. She was talking about Rabdi! Not that Rabdi, I hope!...yes sweet lady that she is, she was talking about Shahi Rabdi! And OMG this is ready in 6 minutes! I don't think anything can get any better than this! Thanks for the lovely entry Archana! Now comes Suma with her Condensed Milk Halwa for the party. She says when she serves this to her guests, its always appreciated and they must've wondered how much toil she underwent for this delicious looking sweet. But she had her secret. She was doing it in Microwave and all within 15 minutes, to be exact 12 minutes! Well everybody ready for daring fleets? Here comes a lady who is ready to take any adventure on stride. She is famous for her baking and chocolate makings. She never fails to impress with the things she can dish out. Next sweet dish from a lady going by the hot name, I mean Red Chillies!. 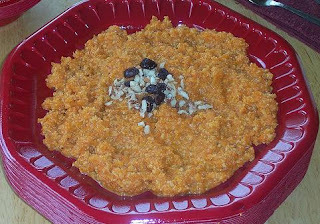 I am very fond of Carrot Halwa, but cooking on a stove means constant stirring and always being next to it. But when Redchillies sent in her recipe, she answered my secret calling. Says that the adventurous part of her, got the better of her and she tried this out. Well I am so glad that she did! She vouches that there is no compromise on taste and even friends, family cannot make out the difference in taste. It is easy, fast, guilt-free and still has the decadent taste, so what else can one ask for? So why wait try out Gajar Halwa the Microwave way all in 12 mins! Now the lovely ladies from The Yum Blog comes to delight us with their varieties of sweets. I have made this on stove and I know how much interesting to get this done in 50 mins! Then comes Dumroot Halwa done in flat 15 minutes! Thanks for the nice dishes, we expect more sweets from you using Microwave! I was sure that anything so delicious and elegant can't be done in short 5 minutes, but Tee beat me to that. She dished out a delicious looking Besan Ladoo in flat 5 minutes. Now this is surely a reason why sweets should be cooked in MW. Aarti who has to cater her husband's wish for a continuous supply of Rava Ladoo, found making this in MW saved her lot of time n efforts. She says she is totally relaxed about this now! 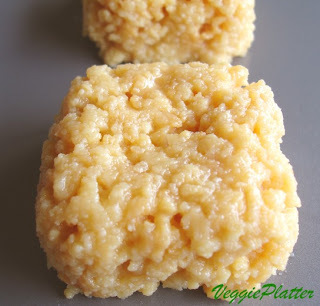 So lets also check out her method to have an easy way with making Rava Ladoo. Padma discovered how useful cooking in Microwave is, if one doesn't have cooking gas/stove. She prepared a simple dessert with apples and it was so easy all done in 12 mins! 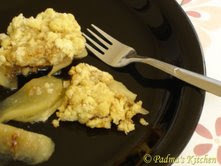 Check here to see how Padma makes Apple Crumble, which her husband loved so much! Rahin says these get ready in a jiffy and is huge hit. Who wouldn't want a quick n fuss free dessert, she says, I agree with too. Check out her Milk Pedas which needs only 2 minutes of cooking time! 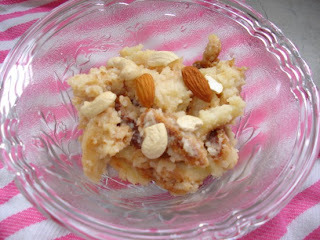 Rachna wanted to post a sweet dish for Lord Krishna, well we also would love to try this out. This Krishna prashad, she says is a regular at Ramayan poojas and Janamashtami at their house. And you can get these sweet pedas done in 12 minutes! 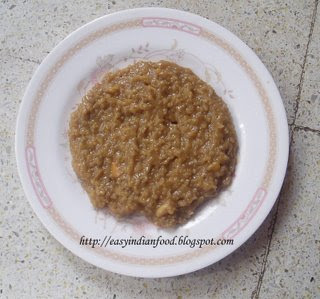 And finally from me - our favorite Bread Halwa. Amma always does this when she finds extra bread slices at hand. But its one sweet dish thats liked by all so much. So it was fun making this within 6 mins! Take 4 slices of Bread. Cut into small cubes. Spread on the mw dish. Top it with Ghee and put it for 1 mins. Breads pieces are roasted by then. Add sugar on top with little milk. Put it for 3 mins. 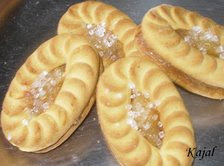 The bread slices become crispy with sugar melted. Then add the remaining milk and put it for another 2 mins. The bread becomes soggy in the milk with crispy pieces in between. Roast Nuts in little ghee for 20 secs. and garnish on the bread halwa. Thanks for all the lovely entries. I sure had fun. Expecting another round of fun event with this Month's Theme. Looking forward for ideas on Basics in Microwave Cooking!